Conquer project management with real-time work management. The Project Management Institute (PMI) text, A Guide to the Project Management Book of Knowledge (PMBOK® Guide) method is a structured approach to analyzing needs, resources, and scheduling to make the most of project management. These key components lead to the most effective and comprehensive approach to project management and its subsequent methods. We’ve compiled the top practices of project management, as detailed by the PMI and the PMBOK® Guide. Learn about the key components of the Project Management Professional (PMP)® certification exam that designate the most knowledgeable project managers, as well as the tips and best practices of project management to incorporate into your next project. Conception and Initiation: The first phase is where the high-level project goals and definition are developed. At this phase, feasibility is determined through discussion and feasibility testing. Once the project is accepted by stakeholders, a project charter or a project initiation document (PID) is created, outlining the purposes and requirements of the project. Definition and Planning: At this phase, a roadmap is created to help guide teams towards specific targets throughout the project. The scope of the project is defined and a comprehensive project plan is developed. The plan identifies variables like cost, quality, available resources, and a realistic timeline. The project plan also establishes performance measures, which are generated using the scope, schedule, and cost of the project. Roles and responsibilities for team members are divvied out accordingly, distributing accountability across the project. Launch or Execution: The project execution phase is when deliverables are developed and completed. There are many moving parts during this phase, like team development, resource assignment, system tracking, project scheduling, and plan modifying. This phase is where the “meat” of the project is completed, and consistent status reports and performance updates keep all goals in check. Performance and Control: This phase is geared towards measuring project progression and performance to ensure that all tasks align with the original project plan. 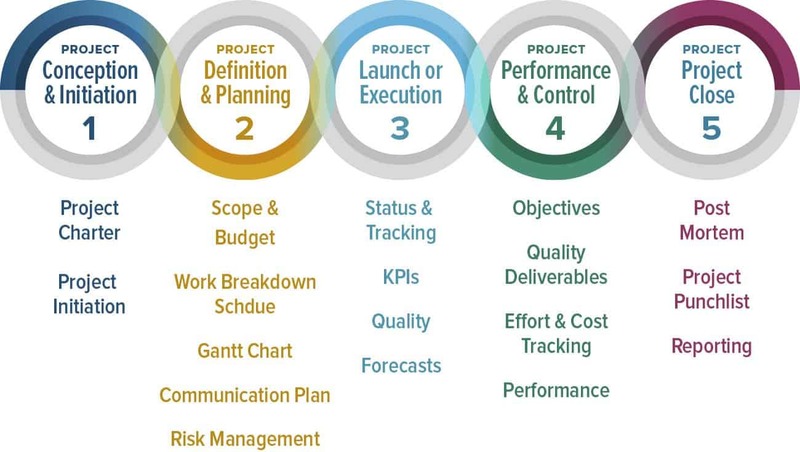 Key performance indicators (KPIs) help to determine if the project is on track based on components like project objectives, quality deliverables, effort and cost tracking, and project performance. Project Close: This phase signals the completion of a project. Project managers are tasked with terminating contractors, recognizing valuable team members, and evaluating a project to identify strengths and weaknesses. After the project is completed, PMs must still create a punch list of unaccomplished tasks and perform a final budget analysis that will go into the final project report. All documents must be gathered and stored for future reference. Use resource calendars to delegate tasks and keep track of timelines, especially when you have overlapping resources. Leverage the project scope and use it as your guide. Use milestone lists to identify and analyze each significant point in your project. Create daily to-do lists and reassess your lists at the end of each day. Share project plans with team members so everyone knows what is expected, and when. Reference historical information to make estimates on new projects. Break down tasks into manageable chunks. Consider all dependant tasks to ensure efficiency and stick to schedules throughout the project. Don’t micromanage — trust that the team will complete the work. Set up meetings sparingly, only when issues are presented or need to be solved quickly. Expect delays: Obstacles can pop up at any point during a project, and being prepared for these issues will prevent unnecessary stress and delays in the long run. Complete a risk analysis early on to ensure you have a plan in place should an issue arise, and add a cushion to timelines should delays occur. Estimate accurate durations: As a PM, you are responsible in guiding team members towards an achievable timeline. Coaching employees to break down work into smaller, manageable chunks will lead to more accurate duration estimates and timelines. Consider everyone’s way of thinking: Not all people work in the same way. Some people may be linear thinking, rooted in logic and numbers, while others prefer to break down objectives and detail each step of every plan before proceeding. Taking this into consideration and balancing all team members’ work styles will better prepare you for leading a project. Play to the strengths of each team member, and leverage those strengths wherever possible. Sometimes you need to take a break from the plan: Project management is not a set-in-stone process, and you must remain flexible to adapt to changes that occur. That’s why, when issues arise, it may be helpful to step away from the project plan and bring your team together to brainstorm a solution. Having the right tools in place to facilitate collaboration and communication will expedite this process and the eventual resolution. *The Project Management Professional (PMP) and PMBOK Guide are registered marks of the Project Management Institute, Inc.